The preceding verse came up in our Sunday service and the pastor posed the question, “Is there such a thing as bad courage?” My immediate response was “YES!” My mind flashed back to a violent time in my life, a time when I thought I had more courage than sense. I was 28, in an abusive relationship and rather than take it one more day, I stood up to my abuser and it almost ended me. He was drunk and stoned and the two together were always a bad combination, things got heated and I stood my ground and tried to dial 911, before I got the last 1 in he yanked the phone from the wall (back in those days phones were still attached to the wall) and wrapped the cord around my neck. I couldn’t breathe, but fought back, until I blacked out, he left me in a heap on the floor. I don’t know how long I was out, but I came to as I heard a loud thump, thump, thump on the door at the front of the house. I tried to move but was paralyzed with fear. It was the police, and my abuser answered the door. He very politely told them there was no trouble here and that we had been having trouble with our phone. The police apologized for bothering him and left. So when the pastor asked about bad courage, I thought the kind of courage that can get you beaten down or even killed. But as the thoughts played through my mind like an old video on a loop, I realized, in that space of desperation, when I knew I couldn’t count on him to change, the police to help or my own strength all I had was God. That moment was the catalyst for my transformation. I didn’t hesitate, I grabbed everything I could fit into my car while he slept. In the early morning hours, as soon as I was able, I consulted with a trusted advisor who had been working with me. He and his wife arranged a safe haven for me and gave me a place to go. In that moment, God answered my prayer. The times ahead weren’t easy, I had to be careful, watch my back, never go anywhere alone, stay in groups, contact an attorney, there were restraining orders, I had to change jobs and move again, all this took good courage, action, and faith, but I was out and I haven’t looked back. For years I had nightmares, but eventually, God took care of those, too. It was a hard lesson for me to learn, but I had to forgive, not for my abuser, for me. I couldn’t allow him to rent space in my head and hurt me by reliving it, over and over again. It was years later when this verse brought me out of my own darkness. “Know ye not that ye are the temple of God, and that the Spirit of God dwelleth in you? If any man defile the temple of God, him shall God destroy; for the temple of God is holy, which temple ye are.” 1 Corinthians 3:16-17. My abuser defiled the Temple by not treating me with respect and loving me as God called him to do. Again, I saw it was God’s battle to fight, not mine, so I had to lay down my hurt and anger and forgive and let God be God, and deal with my abuser on His terms. How He did or will do that is not mine to question, I just know that He will. When I forgave and let it go, my nightmares stopped. It took time for me to trust again, and honestly, sometimes I still struggle with trust. But I have faith. I have seen my faith in action. God took my mess and made a way, when I saw no way. I know many women who lived through a hell similar to mine and some who didn’t make it out the other side of hell and that hurts my heart. My prayers go out to those who live in fear of the one who is suppose to love them. It is my hope that you, gentle reader, do not EVER put yourself in harm’s way. I was lucky that I had a trusted counselor I was working with who knew who to call to help me. If you are experiencing abuse you can call the National Domestic Violence Hotline 1-800-799-7233 or visit their website. My life has changed greatly and I have been blessed for the past 22 years. God gave me a man who truly loves me the way God intended, he is my helpmate, my best friend and I can tell him anything, I can’t imagine my life without him. So, back to the pastor’s question, “Is there bad courage?” I think there are bad decisions, but true courage, doing what has to be done even though it scares you can be good courage. I will close with the quote from Joyce Meyer below. Thank you for reading and blessings to you. There are moments of time that stand out more clearly than the moments that surround them. This post is about just such a moment. I am an old Army wife. During my husband’s Army time, I saw parts the world I might have otherwise missed. I have an abundance of stories from our travels, and eventually I might share them all. As Memorial Day approaches, I felt it was appropriate to share this moment and remember. We were overseas at a time when embassies were being bombed, and security was just beginning to tighten, in the late 1990s. We were encouraged to be aware of our surroundings, to be careful at all times, and to be observant. Since Germany is so centrally located in Europe, groups frequently made weekend trips to shop, explore and learn. 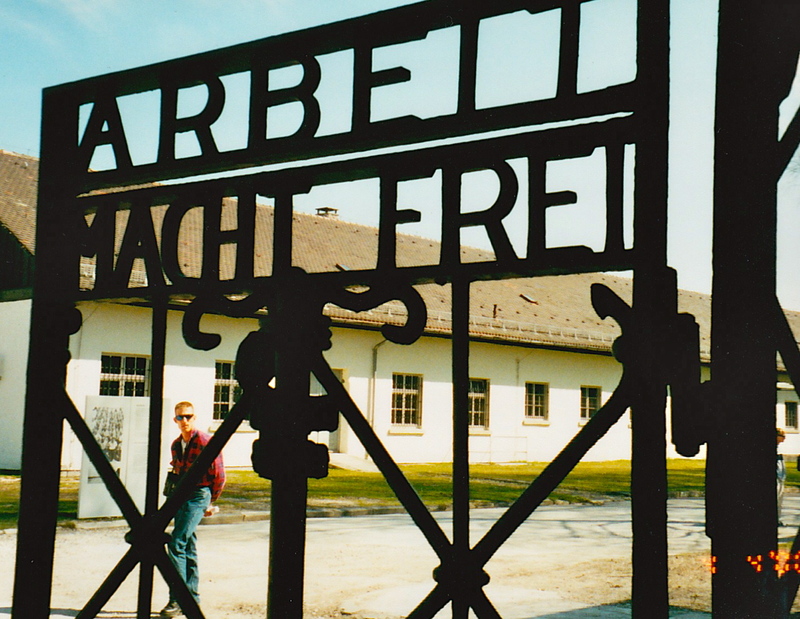 It was on one of these trips that I went with a group of Army wives to the Dachau concentration camp just outside Munich. It is a part of German history that the locals don’t like to talk about, but World War II evidence can be found just walking past a local church or building. The country is steeped in history much older than any American city. In most cities, you could still see the damage caused by bullets and mortars from a war before our time on the facades of the huge stone churches and only begin to imagine what transpired nearly 60 years earlier. Being in that culture makes you want to delve into the history of what our troops went through in an earlier time. Learning from our past we can better understand our present and hopefully not make the same mistakes in our future. The camp opened in 1933 shortly after Hitler became Chancellor. The camp was designed to house political prisoners, and it was the model for all the other camps that came afterward. In it’s 12 years of operation over 200,000 people were imprisoned, and over 40,000 were murdered. It was also known as a “school of violence” for the SS in training. Walking through the exhibits and grounds literally made the hair on the back of my neck stand up. You could feel the sadness and devastation, even 55 years later. From 1959 until 2009 memorials and exhibits were added to the site. In 1967, both the Protestant Church of Reconciliation and Jewish Memorial was erected. On the path between these two memorials, I noticed an old Polish man in a wheelchair with a blanket across his legs. He had his caregiver wheel him up to where we were standing. He began speaking rapidly in Polish and his caregiver, with a tear in her eye translated. I remember standing there in amazement while what she said sank in; he wanted to thank the Americans and our husbands, the US Army and all who gave their lives and served to free him from the death camp. He said he owed his life to the Americans. He shook our hands, and then his caregiver rolled his wheelchair on down the path. The whole exchange took less than 5 minutes, and it forever changed me. 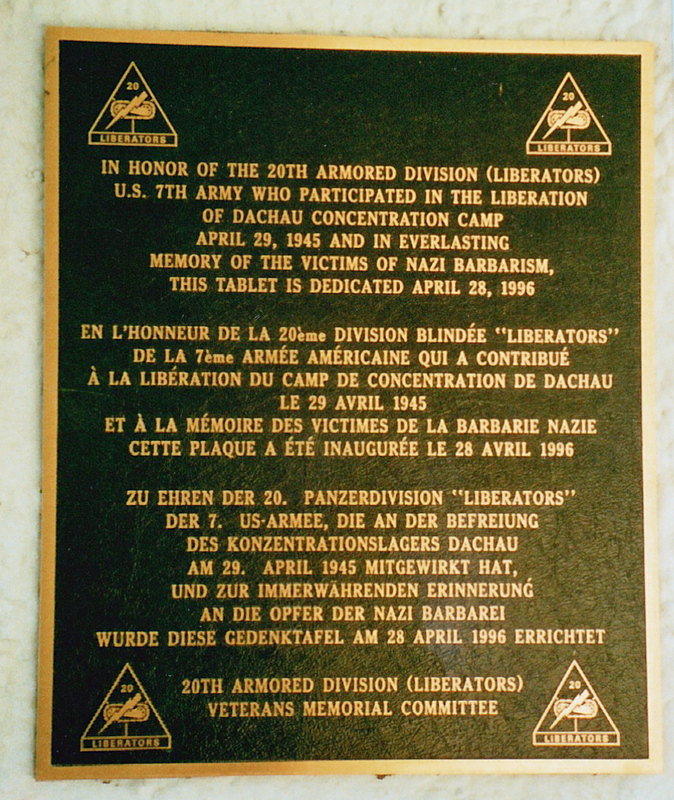 Liberation of the camp by US Army troops took place on April 29, 1945. That was one of the most humbling encounters of my life, and seeing how it affected that little old man, one person. Reading about the experience of those interred there and seeing the actual site was one thing, seeing the gratitude, tears and emotion of what our men and women fight for every day, priceless. In Dachau and other camps millions of lives were devastated. To stand in its confines and see the bullet holes in the stone walls, I will never understand how anyone can believe it didn’t happen. Picture of the monument created by Nandor Glid, a metal sculpture of skeletal prisoners caught as if in barbed wire. It is a chilling reminder of how many died.